I found this link to a real restaurant but its from 2000. Probably closed now. Jack Rabbit Slim's was one of the few sets built for the movie. They were constructed inside a large soundstage (a warehouse in Culver City) that also housed the set for Maynard's Basement and the production offices. The exterior is at the site of an old bowling alley in Glendale, 1435 Flower, currently owned by Miramax owners, Disney. It's close to the location where they filmed the Lance house scenes but a long way from the Wallace Compound in Beverly Hills. 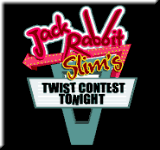 There's also a night club in Perth by the name of Jack Rabbit Slim's.